Until I get a mini-farm and raise Araucana Chickens (Easter Egg Chickens)I am dependant on dying my own Easter Eggs. This year I wanted to dye them with found things from my kitchen. I refused to be dependant on what was offered me from the mega-chains. 2. REPURPOSING SCRAPS - The carrot peels, and cabbage were first used for dye before heading to a worm feast. Cutting down on waste. 3. EXPERIMENTATION - Your kids are sure to have a blast thinking of combos to dye their eggs with. 4. APPEARANCE - The eggs turned out great! They were not psychedelic, tie dyed, or glittery, but were practically perfect in every way. 5. 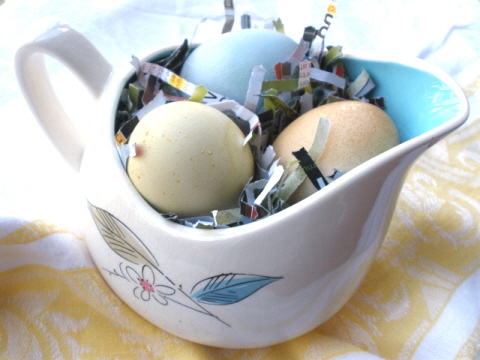 CONVENIENCE - You know you are bound to forget the egg dye kit at the store, and instead of making another trip, you should just give in and make them at home. The instructions and pointers I used were from What's Cooking America. I did not try the rubber band trick, but I'm sure they would have been adorable too. Please note that the 'grass' the eggs are resting on is colorful magazine adds, shredded. The 'grass' doesn't cost a thing and after use can be recycled.